The perfect chair for your outdoor seating area, our POLYWOOD Classic Folding Adirondack Chair offers comfort and style that will last decades! The straight-slatted back leans just far enough and combines with the deep seat to create a body-cradling experience that'll make you relish your leisure time that much more. Easy care poly wood looks great for seasons on end and comes in 12 tasteful colors to suit your tastes and decor. This Adirondack design is a classic in outdoor furniture. 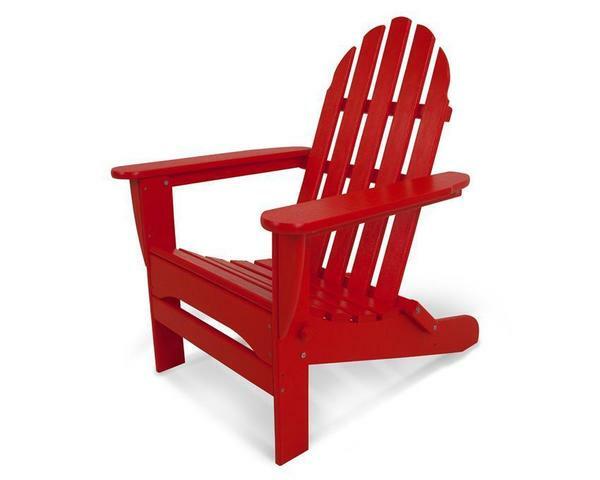 Made of recycled poly lumber, this outdoor Adirondack chair is environmentally friendly and remarkably durable. It is a great addition to any patio or deck and will last a lifetime. This Poly Wood Adirondack is made to withstand a range of climates including hot sun, cold winters, and salty coastal air. Add our POLYWOOD 38" Round Conversation Table to create a unique seating area to enjoy with family and friends! Available in an assortment of finishes, it's fade-resistant colors permeate each board. This Polywood Classic Adirondack Chair is made in the USA! Shipped knocked down, with easy assembly required, our folding Polywood Adirondack is suitable for both residential and commercial environments. Stainless steel hardware is a standard feature. What is Poly-Wood? Poly-Wood is a high performance wood lumber substitute manufactured from high density-plastic. It consist of high density polyethylene resins, select coloring and foaming agents. Poly-Wood is processed into a specification product that closely resembles painted and natural wood products. Poly-Wood absorbs no moisture, therefore it will not Rot Warp Crack Splinter Support bacterial growth Poly-Wood is compounded with permanent, UV stabilized colors, eliminating the need for Painting and Staining Waterproofing Stripping and Resurfacing Additionally, this product is impervious to many common corrosive substances including salt water, as well as gasoline and hydrocarbon oils. Poly-Wood is worked with standard woodworking tools and hardware. Screws are the preferred fastener for the attachment of the material. Poly-Wood is not attached with adhesives; its surface characteristics resist adhesives and the solvents used as carriers for many adhesives. Additionally, Poly-Wood is impervious to paint, stains, and mineral spirits. To maintain Poly-Wood, clean the lumber with soap and water. All-purpose cleaners or 1/3 bleach and water solutions take care of extreme cleaning needs. Poly-wood Warranty Information Poly-wood Inc warranties to the original purchaser, that for a period of five (5) years for residential use (three (3) for commercial use) from the date of purchase against any defects in the manufacturing and workmanship of the furniture components. “Defects” is defined as imperfections that impair the original function of the product. This warranty does not apply to normal wear and tear effects on the furniture, which is received by regular use of the furniture. Neither does it cover damage due to unauthorized repairs or alterations, negligence, misuse or abuse, improper assembly and acts of God. This warranty does not apply to the hardware used to assemble the furniture. The original purchaser is responsible for providing Poly-wood, Inc. with the proper documentation needed to determine a resourceful solution to the defect. Possible solutions are replacement or repair of defective furniture, replacement or repair of defective component or authorization to have product repaired by a third party. Boxed Dimensions - 46" x 30" x 10"
Boxed Weight - 38 lbs.